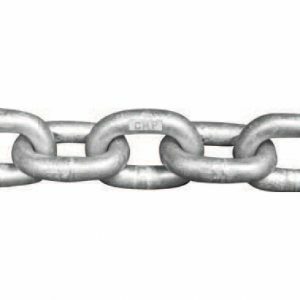 ISO High Test Chain uses high tensile strength carbon steel that provides a greater strength-to-weight ratio than proof coil chain. ISO High Test Chain uses high tensile strength carbon steel that provides a greater strength-to-weight ratio than proof coil chain. ISO short pitch link which makes it more flexible and ideally suited as a windlass chain. Each link is proof tested and calibrated. Check manufacturer’s specification prior to purchase.